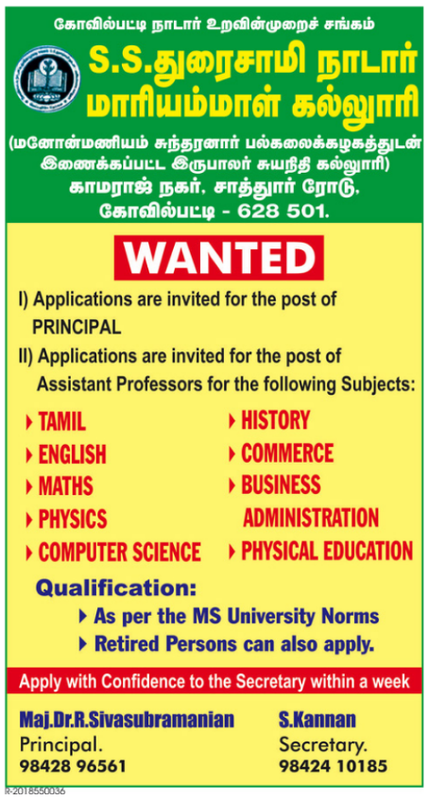 S.S.Duraisamy Nadar Mariyammal College, Kovilpatti has advertised in the DINAMALAR newspaper for recruitment of Assistant Professor / Principal jobs vacancies. Interested and eligible job aspirants are requested to apply within a week from 17th March 2019. Check out further more details below. About College: To fulfill the desire of the people in and around Kovilpatti the college started functioning on 6th September, 1996 in the campus of the Nadar Higher Secondary School with 52 students. On 25.01.1997 construction for the college premises in the permanent campus at Kamaraj Nagar in Sattur Road was started. The House warming ceremony was performed for the new premises on 14.06.1998 and the college was shifted to this new campus. As per MS University norms. Retired persons can also apply.